The second semi final of the 2015 Eurovision Song Contest is on tonight, and 17 countries will be competing for the remaining 10 places in the Grand Final which takes place on Saturday. The question of the day is of course – which 10 countries are going to qualify? Our editors predicted the qualifiers for the first semi final as well, where Ervin and Maciej were the most successful ones with 9 predicted qualifiers each. 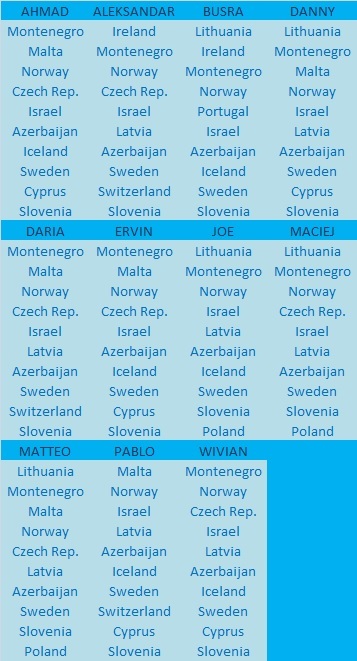 Aleksandar, Danny, Daria, Joe, Matteo and Pablo had 8 predicted qualifiers each, while the worst predictors in our team were Ahmad, Busra, and Wivian with 6 predicted qualifiers each. Who are you going to be voting for tonight?